Yahoo Email Backup Tool provides the functionality to download Yahoo Mail folders including Inbox, Drafts, Sent Items & Trash to Hard Drive / Computer / USB.It can transfer complete mailbox data within a single account to a personal storage file. This file is portable & can be moved to another drive on the same computer or another. 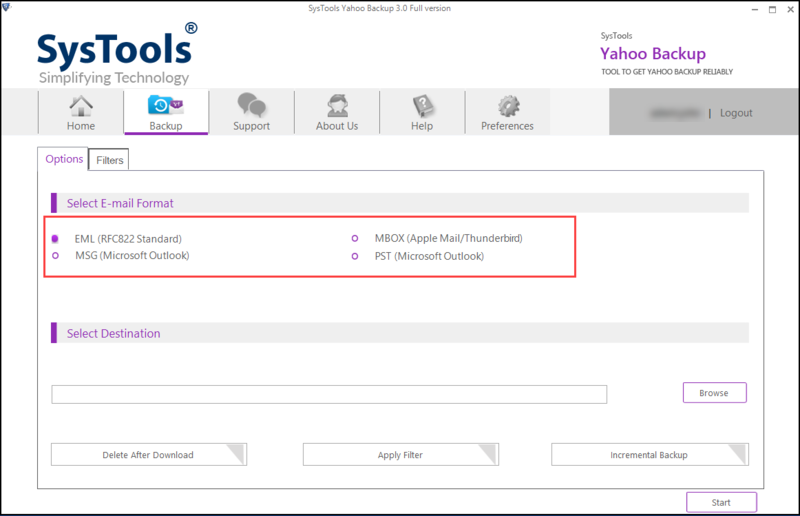 Yahoo Mail Backup Tool exports Yahoo mails to Outlook PST / MBOX / EML / MSG File Formats and move them to Windows Live Mail, Thunderbird, Outlook Express, Mac Mail etc. The Yahoo Archive Software allows to download Yahoo Emails to Computer / Hard Drive / USB. You can keep your emails on the server after backup or delete them. The Yahoo Email Backup Tool allows to save copy of Yahoo mail archive on the local machine and by using Yahoo Archive software, you can delete emails from the server.This can free a lot of space on server mailbox. After specifying the file format, you can also select the mail folders which you want to download in your local machine. The Yahoo Mail Backup Tool gives you the feature to specify number of folders to retrieve. By clicking on checkboxes, you can select/deselect the folders. An email file contains a lot of properties and information in its body and header. The email header stores sender details, cc, to, server information, IP address, SMTP names etc. All of these are retained when backing up emails using the Yahoo Email Backup Tool. The email body and formatting is also kept in the exact form as in original mailbox. The Yahoo Mail Backup Software allows user to Pause and Resume downloading process anytime. You can easily pause the backup process and resume it when you want. There is no limit on how many times the process can be paused and resumed using the utility. There is no data loss in output storage file. As soon as a Yahoo mail backup process is paused midway a Recent History page is displayed. The page contains details regarding the ongoing backup process. It displays information regarding Destination Path, Date Time(time at which archival was paused) and the Email Count(number of emails saved so far). There is an added feature in Yahoo Email backup tool to manage the entire process by adjusting bandwidth usage. Change the percentage of internet bandwidth according to choice. This way backup could run in the background with no effect on usual workings. Import Yahoo Mail to Outlook by saving a backup in a .pst file. 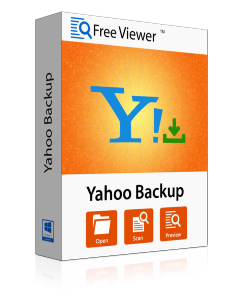 The Yahoo Email Backup Tool provides the functionality of increasing or decreasing the internet bandwidth by adjusting preferences before starting the archival process. This can be useful for large mailbox containing over thousands of emails accumulated over years. Use the Yahoo Mail Backup Tool to take regular backup of mailbox emails and folders. Set a time period of the day during which the archival process will take place. This can set before starting the storage process. Move individual emails from Yahoo to Thunderbird by saving them in EML file format using the backup utility. A complete real-time status report is generated during the storage process. The Yahoo Email Backup Tool report contains details such as a Progress percentage meter, Current Folder name that is being saved. There is also information regarding item count, the rate of transfer per minute and the Destination Path where the output file will be saved. The Yahoo Email backup tool has provided an added facility to change the language preference for the tool. Choose to Migrate Yahoo Mail to Outlook in any of the different language available. The default language for the tool in English. Change this to Japanese, German, French, Spanish, and Portuguese. This is an advanced features of Yahoo Mail Backup tool. The Yahoo Email backup tool is a powerful migration algorithm that can save login credentials. So the next time someone logs in, they do not have to type in Yahoo username and password again. This is a useful feature when internet speed is slow and backup needs to be paused again and again. Just save login information to grant mailbox access to the application faster. The Yahoo Mail folder backup tool ensures complete data security and privacy. The email information is not shared with any third party and neither it is used by the tool in any way. Even the folder hierarchy is maintained and read or unread emails are found as in the original mailbox. The output Yahoo email backup file of choice can be moved to any drive on the computer or on another computer. It can also be taken across platforms on a system having a different operating system. 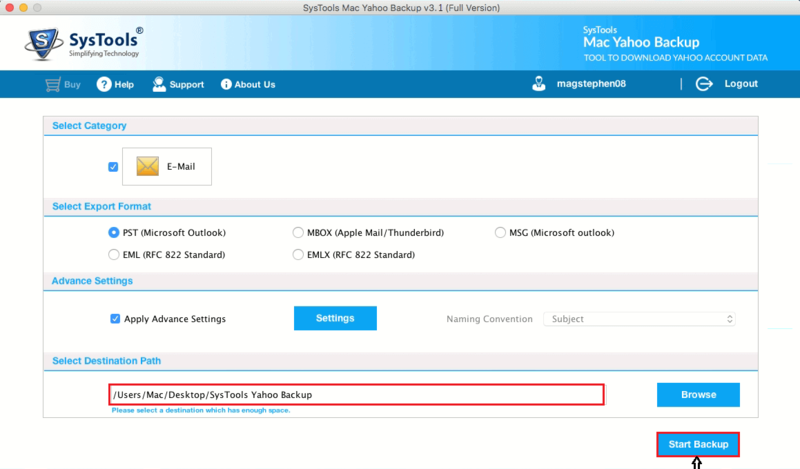 Use theYahoo Email Backup Tool to export mailbox from Yahoo Mail to Apple Mail. This can be done by taking the backup file from a Windows computer to Apple Mac operating system. The Yahoo Mail folder backup utility can move emails from Yahoo to Outlook. The storage repository created by the tool can be used to import Yahoo Mail to Outlook using a .pst file. It is essential that the system where the conversion is being performed must have MS Outlook 2016 / 2013 / 2010 / 2007 / 2003 / 2000 application installed beforehand. This is absolutely necessary to perform the migration of mailboxes. How to Backup Yahoo Mail Folders to Hard Drive? 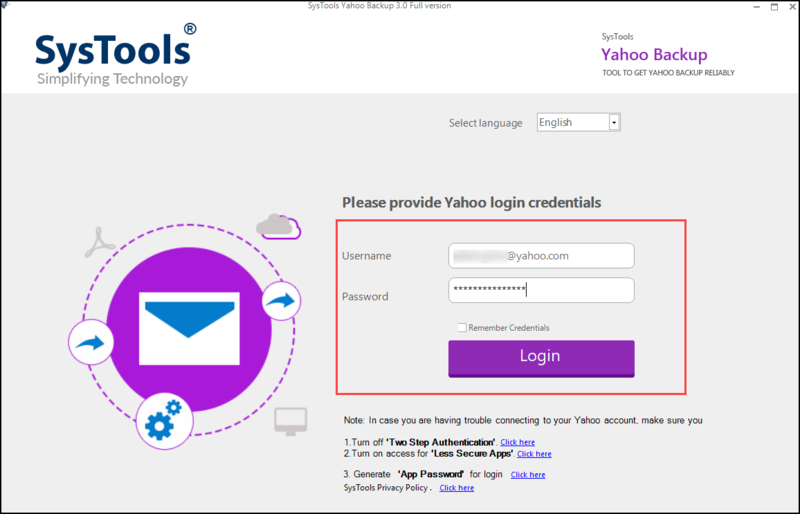 Free Version of Yahoo Backup Software Extracts Emails from Yahoo Mail to PST/EML/MSG/MBOX within Limit of 100 Emails & Expires after 30 days. Can I save my mailbox data directly to a CD/DVD using this software? No, the Yahoo Email Backup tool does not have an option to burn Yahoo mailbox data directly to a CD or DVD drive. However, one can save the mailbox content to any of the four file formats: MSG, EML, PST, MBOX and burn that file to a CD/DVD. What is the time taken to backup over five thousand emails? The time taken to backup Yahoo Mail completely depends on the internet speed and bandwidth. Adjust the bandwidth percentage to fasten the archival process. I Need to transfer my emails from Yahoo Mail to Apple Mail. Does this tool work on Mac OS? No, the Yahoo Mail Backup software is only compatible with Windows operating system. It cannot run on computers using Macintosh operating system. However, to move Yahoo Mail to Mac Mail try saving mailbox in a MBOX file format to do so. Could you let me know whether this tool can move contacts from Yahoo to Outlook? No, this Yahoo Email Backup tool is meant for saving emails to an MS Outlook PST file. Contacts and other mailbox items cannot be moved using this tool. Is Outlook licensing required to backup Yahoo Mail inbox folder? Outlook installation is necessary only when saving email data to a PST file format. Is there a facility to filter out emails according to a keyword or a phrase? No, the Yahoo Mail Backup tool can not filter out messages based on a particular phrase. There is a way of filtering emails based on a date range. "I was not able to find any solution to export Yahoo Mail to EML. This Yahoo Email Backup Tool has given such a relief to me. The Yahoo Mail Archive Software downloads Yahoo Mail Folders in EML without any inconvenience. Thank You to the developing team for making such a marvellous product." 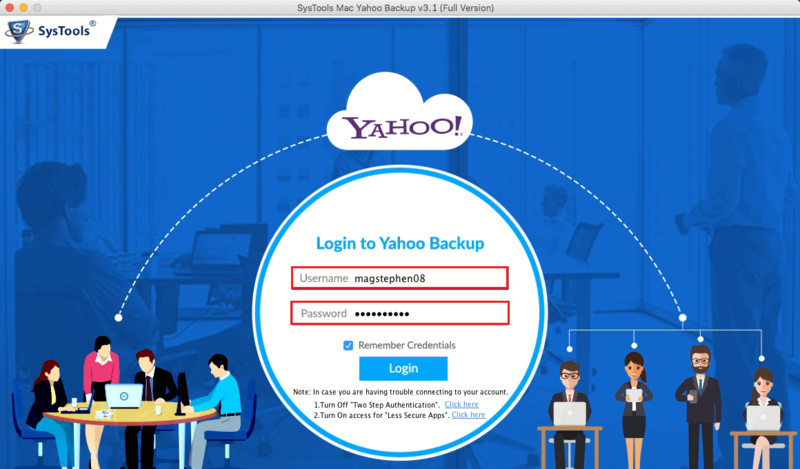 The Mac Yahoo Backup tool allows users to backup emails of Yahoo account on macOS without any fail. It saves emails from Inbox, Sent Items, Drafts, Outbox folder, etc into PST, EML, MSG, MBOX, EMLX format. During the backup process, software preserves all the metadata properties of emails. Also, it takes minimum time to backup all the Yahoo emails on Mac platform without losing any information. The software is built with an advanced algorithm that allows users to download the Yahoo emails in the following four formats. With the help of this software, one can take backup of desired email folder in any file format. To do this, users need to select the checkbox corresponding to ‘Include Folder’. After that, add the name of folders from which you want to create backup file. Also, this feature is case-sensitive i.e., user needs to write ‘Outbox’ instead of ‘outbox’. Exclude Sent: This option does not include sent items emails in the resultant backup file. Exclude Deleted Items: This feature work is to remove deleted folder emails from the output backup file. With this Yahoo Backup for Mac Tool, users have the flexibility to export only desired emails folder to Mac platform. This can be done by ‘Date Filter’. By using this option, one can download the emails within a specific date range in PST, EML, MSG, MBOX, and EMLX file format. Date filter saves lots of user valuable time by saving only the required email data. Yahoo webmail application provides limited storage space on cloud in order to save emails. So, the software provides an option known as ‘Delete After Download’. Users can use this feature and delete the emails from Yahoo mail account after downloading into in desired file format in Mac system. So, select this option before starting the process and create new space in Yahoo account. The Mac Yahoo Mail backup software is well equipped with versatile feature and ‘Incremental Backup’ is one of it. 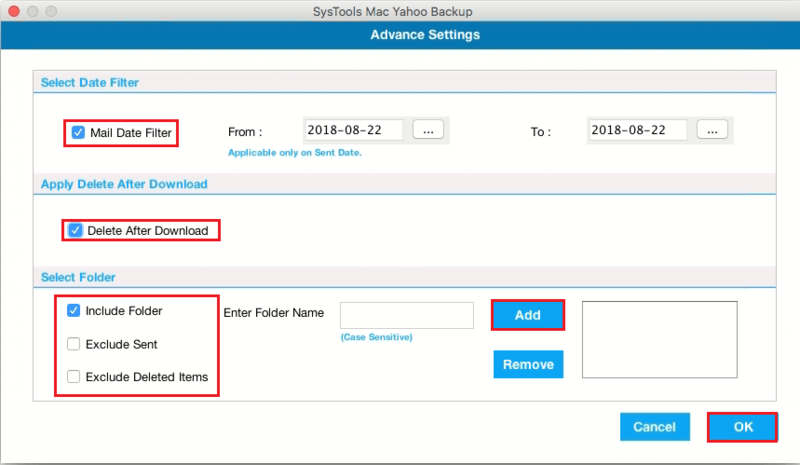 With the help of this option, if a client has once saved the messages from Yahoo account, then the software will download just new emails from the previous backup. To do this, one can need to select the option and prevents multiple entries of the same email in the backup file. Another interesting feature offered by Mac Yahoo Backup tool is Naming Convention. Whenever the users save emails of Yahoo account in EML, MSG, EMLX file format, the software provides multiple file naming convention options. As per need, users can select the naming convention such as Autoincrement, Subject+Date, From+Subject+Date, etc. With the help of this option, users can organize the emails in backup file. It might be possible that there will be some internet connectivity issues during backup of Yahoo emails on the Mac system. To handle such type of problems, the software has an option named as ‘Pause and Resume’. With the help of this feature, users can stop the process anytime in case of an emergency. Thereafter, resume the Ymail backup process where it was halt prior. 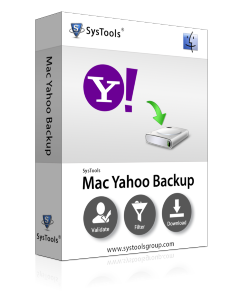 The Mac Yahoo Backup tool allows the users to view and save complete backup process report in CSV format in the Mac system. The report includes details like Source Account, Folder Path, Mail Count, Fail Count, Status. Users can use this export report later for the reference. In case, if there is a fail count, then the software will generate a fail report that consists of information like Report, Folder Path, and Subject Name. 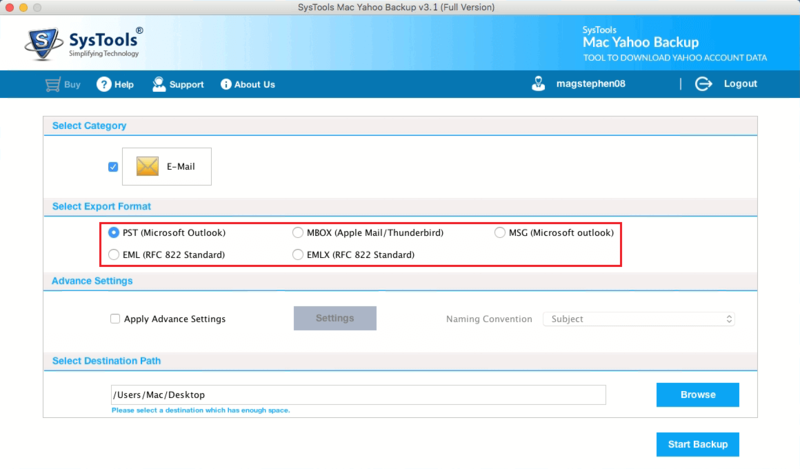 Demo Version of Mac Yahoo Backup Software will take backup of 100 emails from Yahoo account into PST, MSG, EML, EMLX and MBOX format. 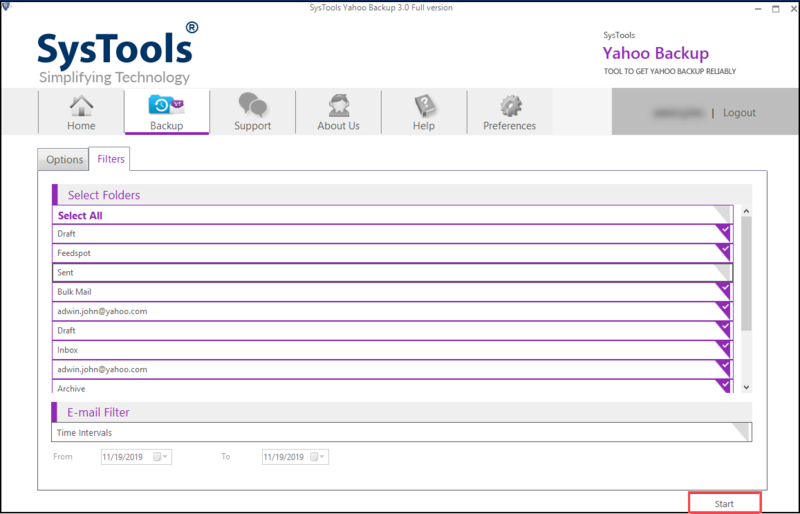 Does the tool need installation of any other application to perform Yahoo backup process? No, the Mac Yahoo Backup software is a standalone application that does not require any other program for the completion of task. Is it possible to save attachment associated with Yahoo email in Outlook PST format? Yes, the software is capable to export complete emails along with attachment into the desired file format, including PST without any hassle. I am using Mac OS X 10.8 Mountain Lion. Does this tool work for me? Of course, Mac Yahoo Backup software is compatible with macOS 10.8. It supports all the major versions of Mac Operating system. Does the Yahoo Backup for Mac software display status of failed count? Yes, the Yahoo Mail Backup Wizard generates a report that will contain information of failed count such as the path of folder and subject name. Will the Mac Yahoo Backup software requires an internet connection? 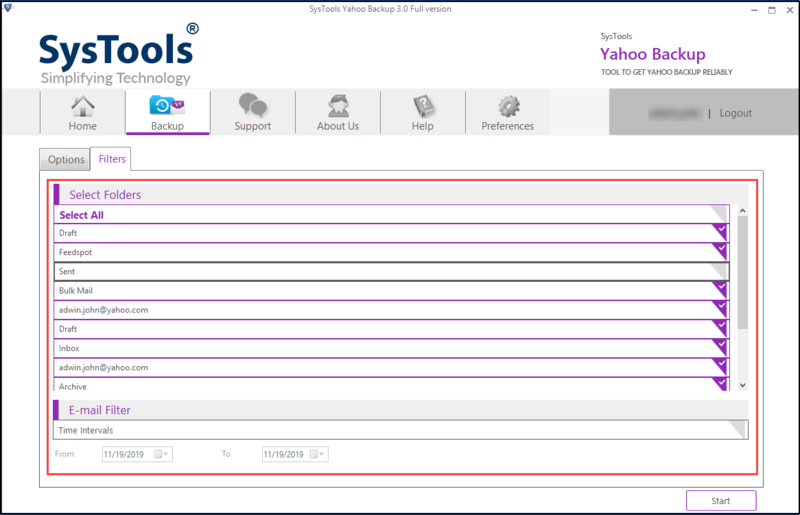 Yes, the tool requires internet connectivity in order to export emails from user Yahoo account.